A very hard 181 km stage across the Western Alps featuring 4 categorized climbs, all of them being long and testing ascents. Past the Colle del Lys, the stage features the Colle delle Finestre (Cima Coppi) with a 9-km dirt road. This time the finish is not located in Sestrière, which is crossed by the course, but in Bardonecchia (Jafferau), after a 7-km climb at a 9% gradient. It is the same place where Eddy Merckx joined and passed Josè Manuel Fuente, who had attacked, in 1972. 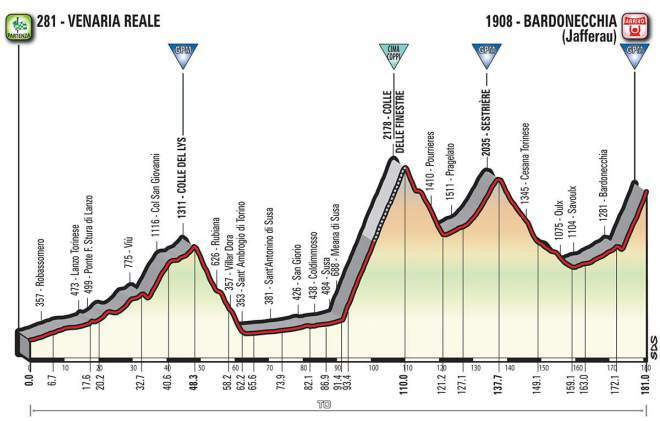 During the “back-up” stage in 2013 that climb was raced without any previous ascent and the finish line was crossed by Mauro Santambrogio (later disqualified) and Vincenzo Nibali, who won the Giro.